The final article in this four-part series on WRAP for chronic pain is about dealing with the predictable but not the inevitable. The previous article discussed some of the components of a Crisis Plan that can make difficult times with chronic pain a bit easier to tolerate. This requires a multifaceted approach, with priorities that shift based on each situation and individual. In this article, we’ll talk about the final part of your WRAP, the Post-Crisis Plan. Today, anyone dealing with chronic pain must become informed and stay involved in medical decisions, especially about pain management and the safe use of prescribed medications. 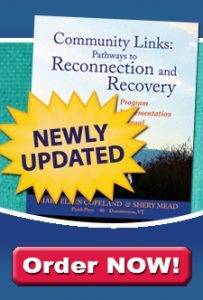 This is particularly critical for people in addiction recovery. Some medications are low risk, whereas others have a high potential for misuse and often contribute to relapse or result in a physical dependency even when used as directed. One person may be affected negatively by a medication that another person can use safely. The only rule that applies to everyone is the more you learn about every aspect of your treatment and care, the better. Medication interactions can be checked online against multiple drugs. The information I have gotten from pharmacists has been more reliable than what doctors have provided, but I check everything for myself before or after I ask a question. Ten years ago, a psychologist with specialized pain management training introduced me to the concept that reducing pain often requires interrupting it. Some people with chronic pain can benefit from a short-term use of opioid medications to accomplish this, but it is wise to have an exit plan in place before bringing them on board. Long-term administration of opioids requires medically managed detoxification supervised by a physician with addiction medicine experience, as well as gradual tapering to avoid additional discomfort. Clear directives about medications I need to avoid, the ones that have helped me in the past, and the medications I am willing to take if necessary are a key component of my chronic pain Crisis Plan, along with designated support people who have been briefed and are ready to stand by me or jump in and make sure my wishes are honored. What can I keep doing for myself? What can I do but don’t particularly want to do for myself? What are the things I’d really like to keep doing for myself if I possibly can? The Post-Crisis Plan is especially important for people who have “flare-ups” with pain levels that peak and recede. This section can depend on the severity and duration of a flare-up. Some of the sections that can help you determine your readiness to resume responsibilities and taper off assistance with tasks can be completed in advance; other parts are more easily developed during the initial weeks and months that follow a crisis. My plan begins with a description of the level of functioning I can expect to be able to return to, what type of help I may need for an extended period, and acceptable accommodations I may need on a long-term basis. Thinking about what and how to replace what I can’t reclaim involves flexibility and creativity. For example, I was unable to walk my beloved dog, Sid Vicious, for almost three months while undergoing treatment for a condition last year. It was painful to see him waiting by the door, even though people came to walk him. So, instead, I arranged for him to spend a few weeks at a farm that belonged to a good friend. He had a ball, and upon his return, I could walk him again, gradually increasing the distance until we could make it to the woods where I’d unleash Sid and watch him run free. That vicarious taste of freedom is as healing as any medicine I know. It’s the kind of freedom we all want to preserve and protect, and it’s the kind of freedom I wish for any and all with chronic pain. I hope WRAP can help you to preserve your sense of freedom and ease. Your turn: How do you return to your regular level of activity following a pain crisis? Please share about your Post-Crisis Plan on our WRAP Facebook page.